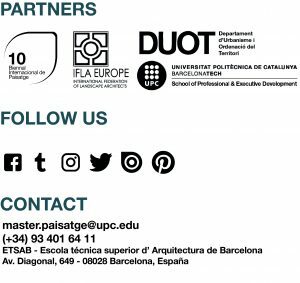 THE GREEN SYSTEMS – Master in Landscape Architecture Barcelona – Universitat Politècnica de Catalunya – 35ª EDITION. In the structure of the Master of Landscape Architecture, it corresponds to the workshops of the Green Systems the introduction of the student to a different understanding of the reality and diversity of the territory. In the course, the concept of Green Infrastructure is taken as a reference on which to develop the project of landscape architecture. In the workshop we will enter the territory through its green infrastructures, we will know its structures, its functionality and the ecosystem services that they provide. Indeed, the human species depends directly on natural systems and the services they offer for survival on the planet (biodiversity, air, water, food, resources …). natural and semi-natural and other environmental elements, strategically planned, designed and managed to provide a wide range of ecosystem services “. This paradigm shift requires a landscape architecture project that is able to identify these green infrastructures in the territory, evaluate their situation, and detect their potentialities in order to plate interventions that improve it, consolidate it and make it durable over time. The observation of a landscape from an ecological perspective, that is, beyond the perception of images, nourishes us with immediate information about the potentialities and limitations of the territory. This vision of the place more enriched than those that we have considered so far, allows us to think about strategies that allow a balanced interaction between humans and their environment that responds to the needs and expectations of both. Indeed, actively considering applied ecology allows materialisations to be developed as innovative as feasible, as stimulating as useful, of our different postulates and proposals. Even more so when we are entering and betting to establish a better relationship with our environment, to be more aware that we are part of it, and to intentionally avoid or not this reality, has only led to imbalances that sometimes involve problems. The workshop will be oriented to project experimentation based on the consideration and management of the biodiversity and the implementation of an ecosystem, considering its emerging properties applied to landscape design. improvement of the systems and their result in the place, besides considering their evolution over time.